Properties in Peace Kannon average 4.2 out of 5 stars. Near Peace Park ,comfortable ,clean , free bikes . Property 37: Near Peace Park ,comfortable ,clean , free bikes .
. Easy to fallow entry instructions. Great location.It could use a chair. Nao's place was fantastic! It was very close to the Hiroshima Peace Park and my large extended family were all comfortable staying there. 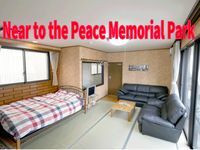 In fact they hope to be able to stay there again next year if we are able to make the Hiroshima Peace Memorial Ceremony. Thank you for helping my family enjoy this experience.